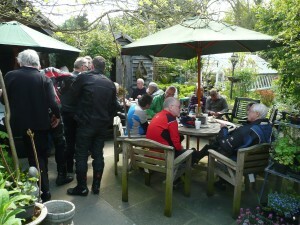 Megarry’s teashop is in a perfect location for motor cyclists to come and enjoy some freshly made cakes in the beautiful scenery Blackmore has to offer. 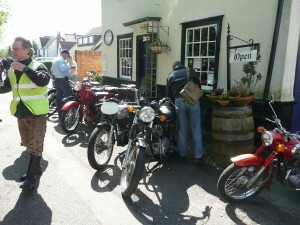 Arriving in Blackmore, turn down by the war memorial , and tucked behind Blackmore’s picturesque Village (Duckpond) Green in Jericho Cottage, is Megarrys.. The relaxed and friendly tea & coffee shop caters for every taste in hot and cold beverages, and offers a wide choice of sumptuous home made cakes and sponges, rock and cup cakes. We also serve scones with cornish clotted cream and jam. You can also enjoy freshly toasted crumpets or teacakes. In cooler weather you can warm up with a cup of soup and a hot roll, also available are beans on toast or a hot sausage roll. Our snack range includes flapjacks, shortbread, biscuits, chocolate and crisps. We also have a range of wheat and Gluten free treats! If we haven’t got your favourite tea or coffee on your first visit we will almost certainly have it next time you visit us! Just ask! 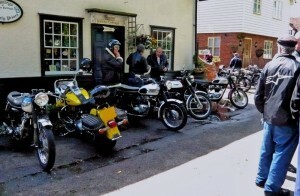 Here at Megarry’s antique and teashop we often hold B.O.C Veteran and vintage motorbike days yearly on the second Sunday in May on the village duckpond green, on these occasions we raise money for two charities St Francis Hospice and Essex air ambulance service. To make an enquiry or if you have any questions, don’t hesitate to give Judith a call on 01277 82103. She will be more than happy to help in any way she can.